A Society, formed in 1967, “to advance, provide and encourage for the public benefit the art of handbell tune ringing in all its forms." This group is the only national organisation supporting hand bell, handchime and Belleplate players. The Society presents to its members a wide range of activities and music designed to show the many aspects of handbell tune ringing. 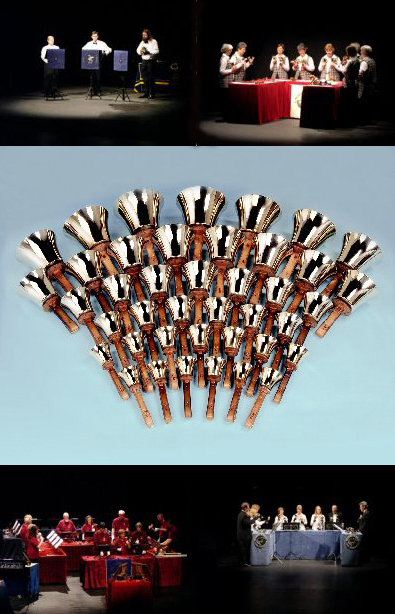 A Society, formed in 1967, “to advance, provide and encourage for the public benefit the art of handbell tune ringing in all its forms.” This group is the only national organisation supporting hand bell, handchime and Belleplate players. The Society presents to its members a wide range of activities and music designed to show the many aspects of handbell tune ringing. The Society is organised into 8 regions giving access to a nationwide network of handbell ringers from all walks of life and of varying abilities. Each region holds rallies where teams have the chance to ring individually or to combine to ring the same piece of music in ‘massed’ ringing. Workshops are also organised in the regions for teams to try out other ringing methods or techniques. A National Rally is hosted by a different region each year. This may be either a one-day or a weekend event, which culminates in a concert by some of the participating teams. Great Britain is one of six countries to host the International Handbell Symposium which is held every two years giving members the chance to visit Japan, Korea, Australasia, Canada and America to meet and ring with handbell teams from these and other countries.